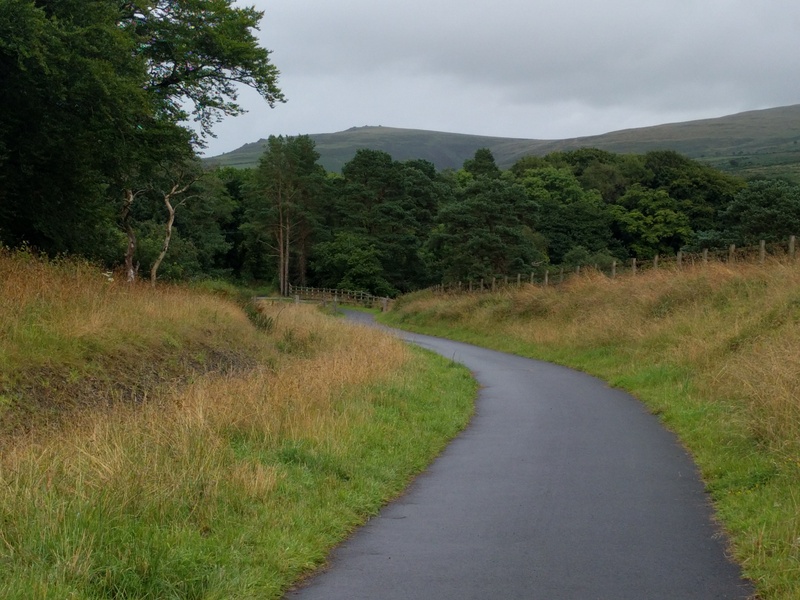 It started out ok, with a long-ish walk along the old railway, now part of the Granite Way cyclepath, but the sky was grey and some rain was expected. Nothing I couldn’t handle and the forecast suggested a few scattered showers only, so that was fine. 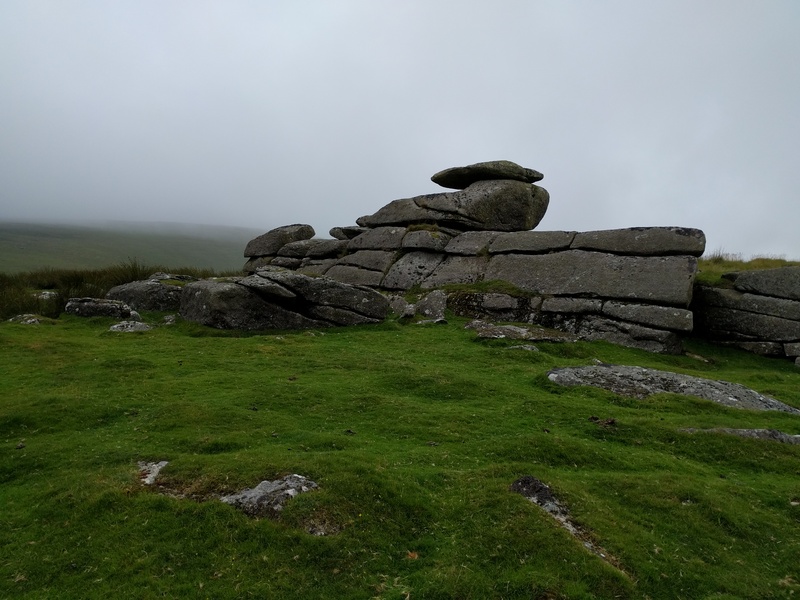 It actually seemed a bit brighter as I climbed up onto the hillside for my first tor – East Tor, one of seven outcrops forming Sourton Tors. 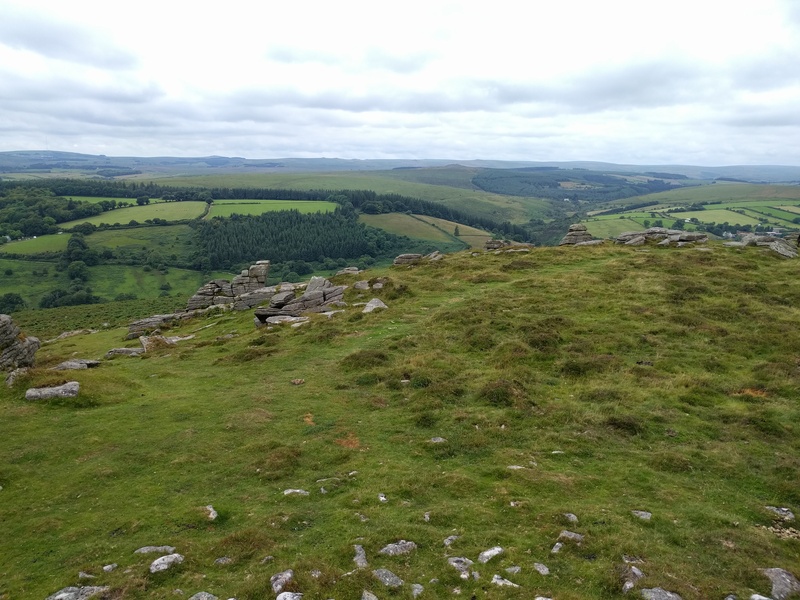 A bit of faffing about working out which one was actually East Tor, with lots of reference to my laminated tor card, and waiting for the Direct Message from @advbot to confirm I’d found it. Then it was up to the top of the hill for the main tor. 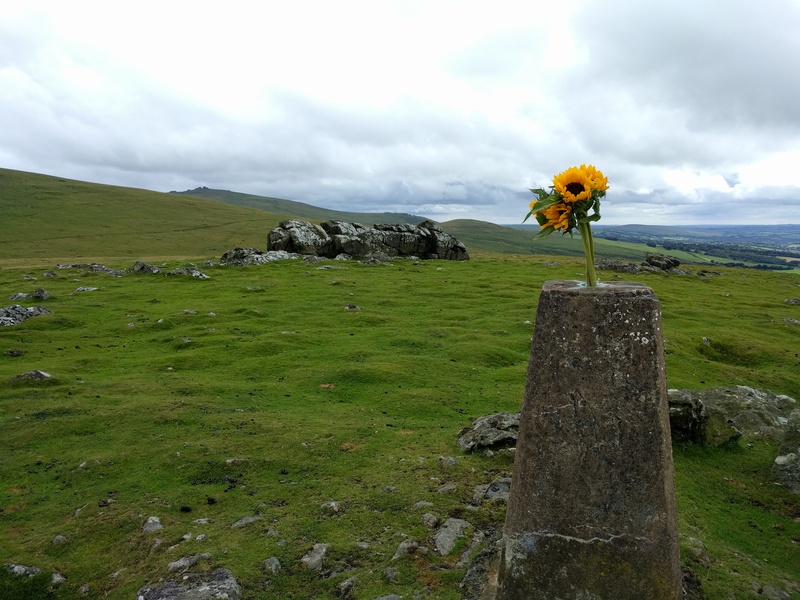 Someone had stuck some sunflowers in the top of the trig pillar. As you do. 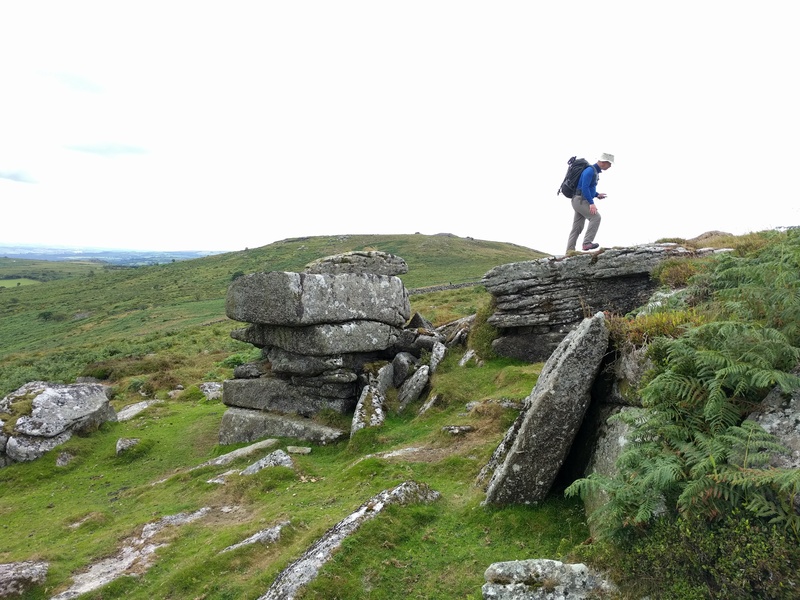 I headed in the direction of Shelstone Tor, trying to avoid gaining too much wasted height. Over here it was a bit murkier with some low cloud hanging over the West Okement. 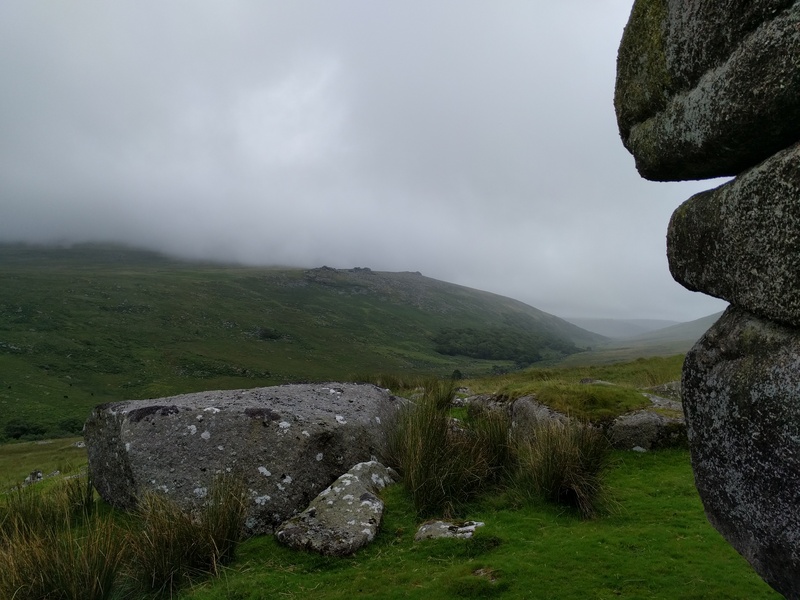 As I explored the tor, the rain came in – fine misty drizzly rain that soaks you through gradually by stealth. The variety of overhanging rocks of the tor provided some good shelter though. 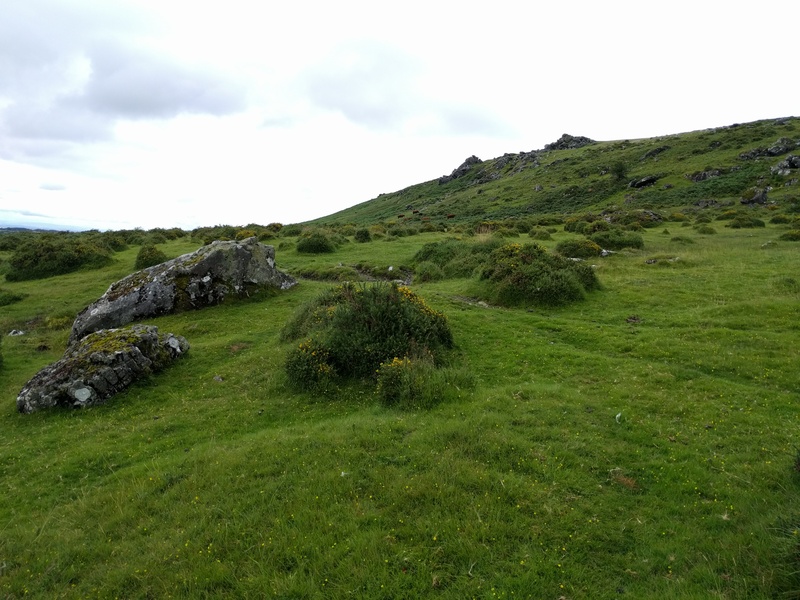 This is a tor I’ll have to come back to in better conditions – lots of patches of grass all around the tor, almost like it is divided up into rooms. 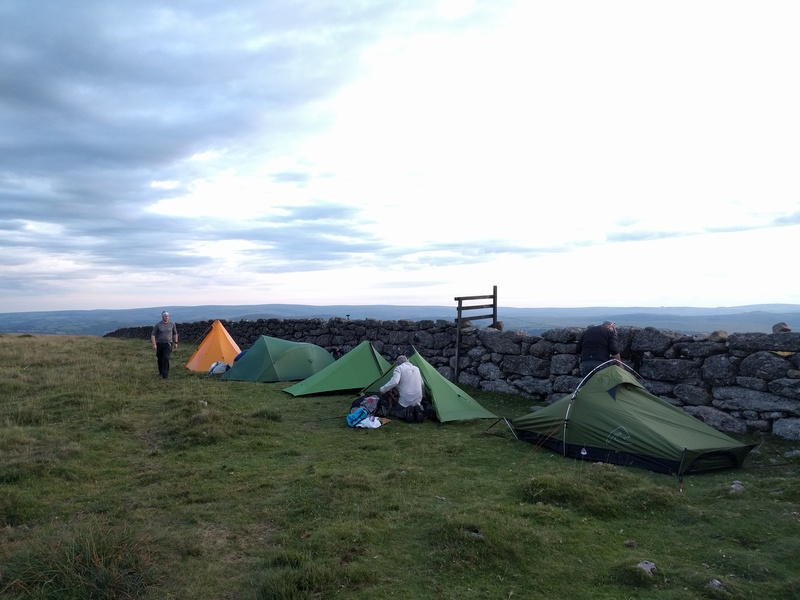 And with a view down to Black-a-tor Copse and Black Tor itself, it’ll be a good spot to spend the night. 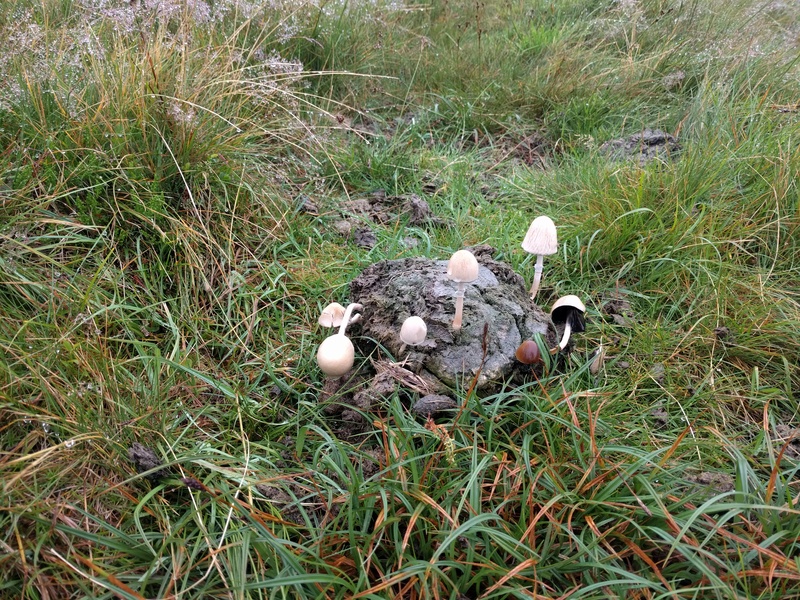 Now the difficult one – Slipper Stones – and the challenge of finding a patch of scattered rocks on a hillside consisting mainly of scattered rocks. I headed along the hillside looking for the likeliest candidate. The tor card told me they were quite high up, my gut suggested they were “those rocks a long way below”. In these conditions, I decided to leave it to fate and bagged the higher patch. If the true Slipper Stones were the ones below, they’d be better off bagged from the river anyway. Which of course turned out to be the case. Bagless, I continued up the hill using the compass to cross the soggy pony- and cow-strewn plateau. Mist swirled around but enough cleared for me to see I was heading directly for my next target – Branscombe’s Loaf. 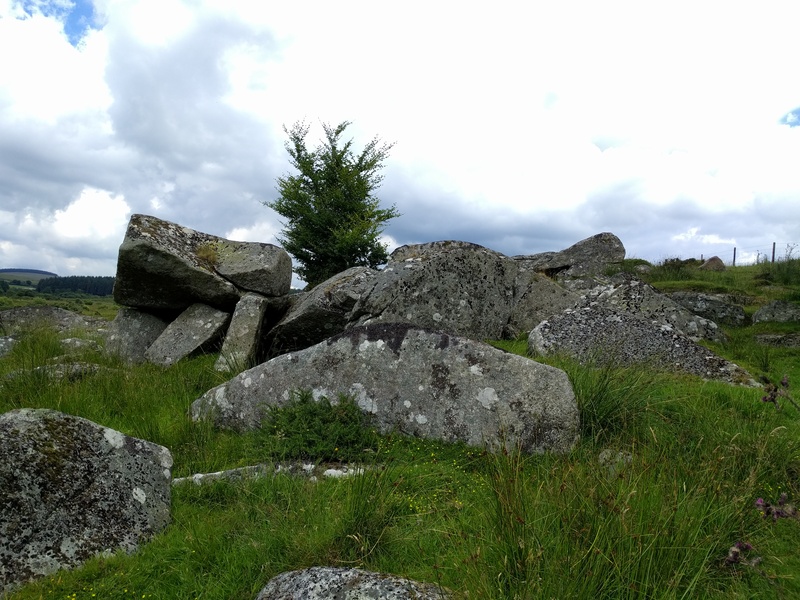 A neat little pile of rocks, but today not an inspiring place to linger, especially as I wasn’t making great time. I couldn’t even see the way forward now, and the compass became critical. Even so there was a bit of zig-zagging as I flicked between walking on compass bearings and following the obvious terrain. After what seemed like ages I saw Kitty Tor ahead and something else to my right. I headed for the “something else” purely because it was nearer. 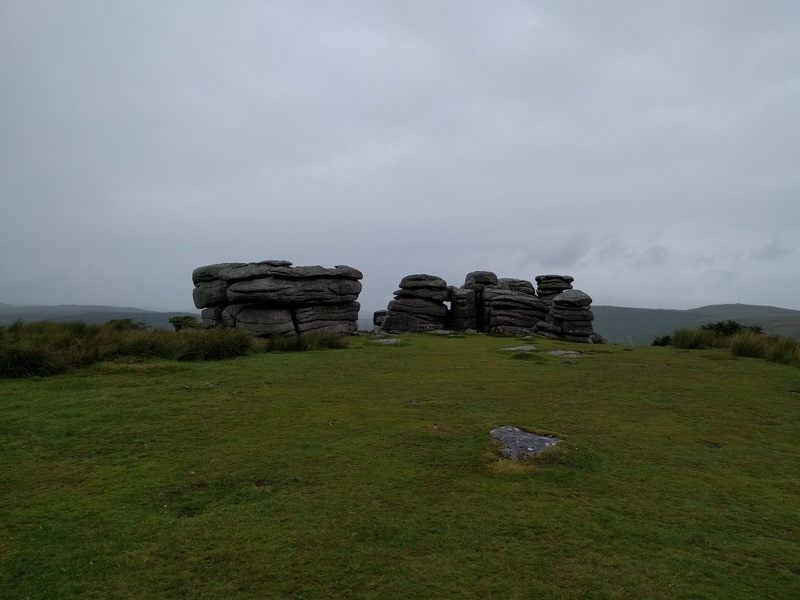 It turned out to be Hunt Tor. Now just a matter of getting past Great Links Tor and the Dunna Goats and I’d be on Rattlebrook Hill for the next bunch of new tors. The weather had different ideas though, and as I hit the track below Great Links I decided to bail out. Clearly it was going to be like this for some time. 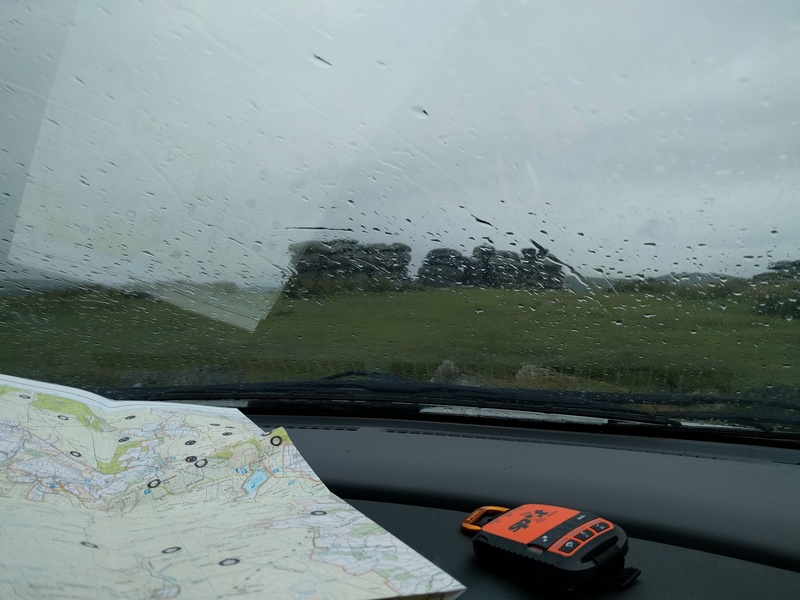 I’ll take a camp in the rain with zero view when I have to, but not if there’s a better option. A bail out to Paul’s place and a trip to the pub was clearly a more attractive option. 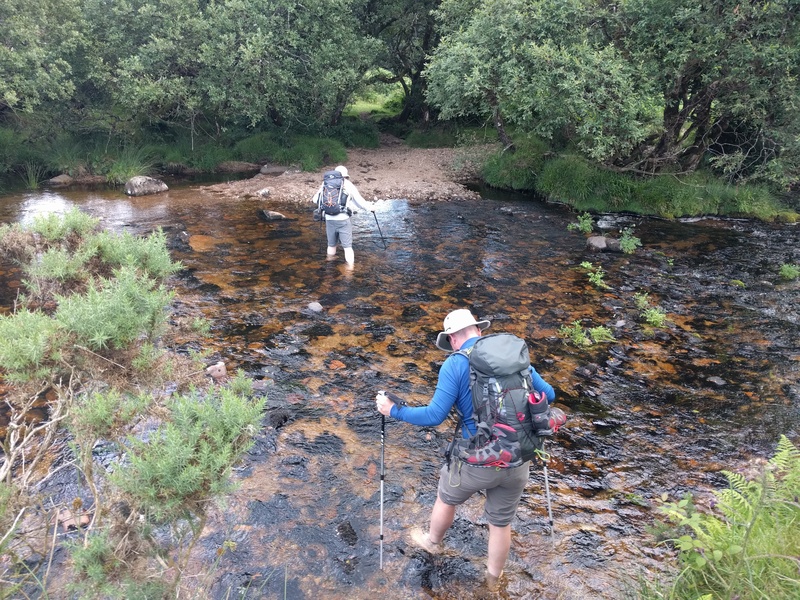 To avoid any silly navigational issues and in the hope of making good time, I decided to simply follow the track towards Gren Tor and back alongside Great Nodden. Longer but easier in these conditions. It still took nearly two hours to get back to the car though, and 13 miles in a half day walk after a couple of weeks of inactivity meant I was glad to see the car. 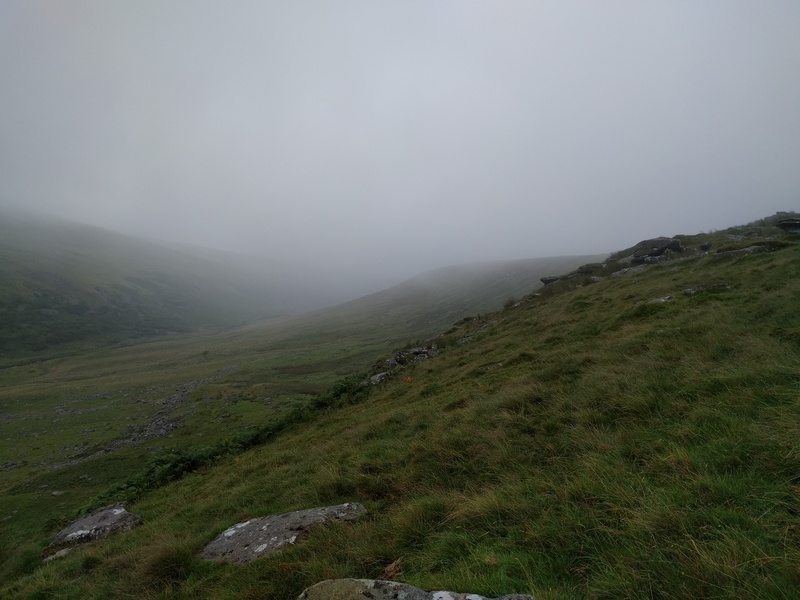 In hindsight, I should done the walk from Meldon, then driven to Lydford afterwards for the camp, if I still wanted to do it. Heigh-ho. 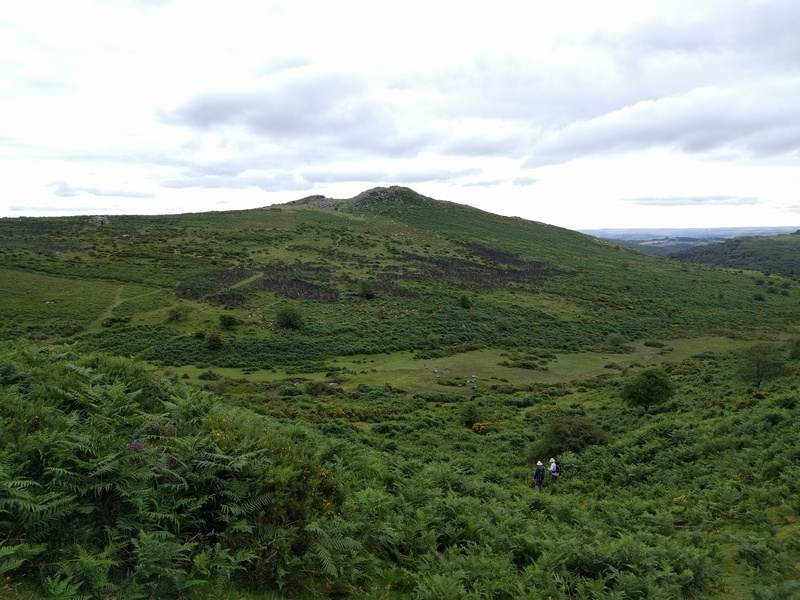 The group hadn’t been able to agree on a walk we all wanted to do as Colin and Neil favoured a huge round near Haytor, which Paul had done three times already, and I’d done some of too. So the idea was to meet up later in the day for the walk to camp, but to please ourselves in the meantime. We still all met up in the Fox Tor Cafe for breakfast though. It’s a rule. 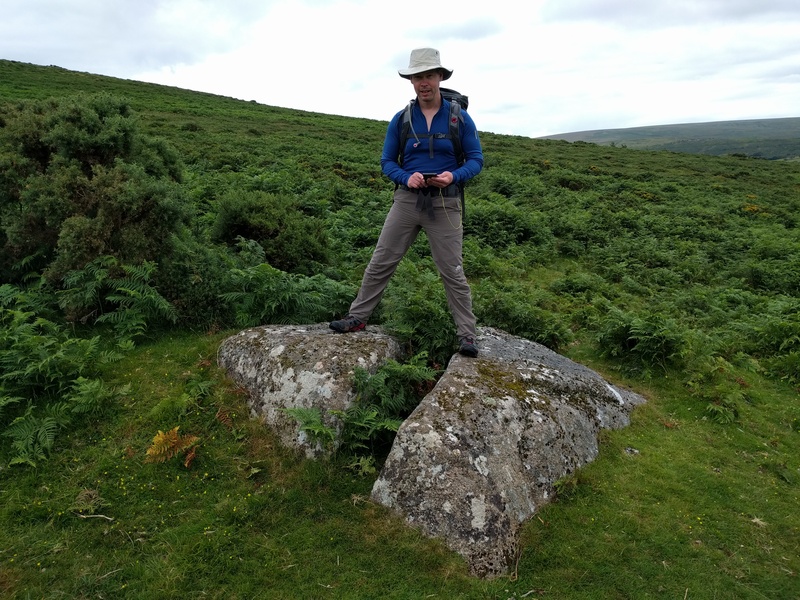 We drove out to Dartmeet and trudged our way back up the hill to find the first thing on the list – the Coffin Stone. No wonder I never found ti before. It was hardly imposing. Jim standing on it didn’t make it (or him!) look any more imposing either. Along to Sharp Tor, Social Hiking actually bagged us Little Sharp on the way, although we were a good distance away from it. Sharp Tor itself provided the first opportunity for a bit of tor-sitting. Paul seemed to like this one. We then went back towards Little Sharp, visiting the actual tor this time. 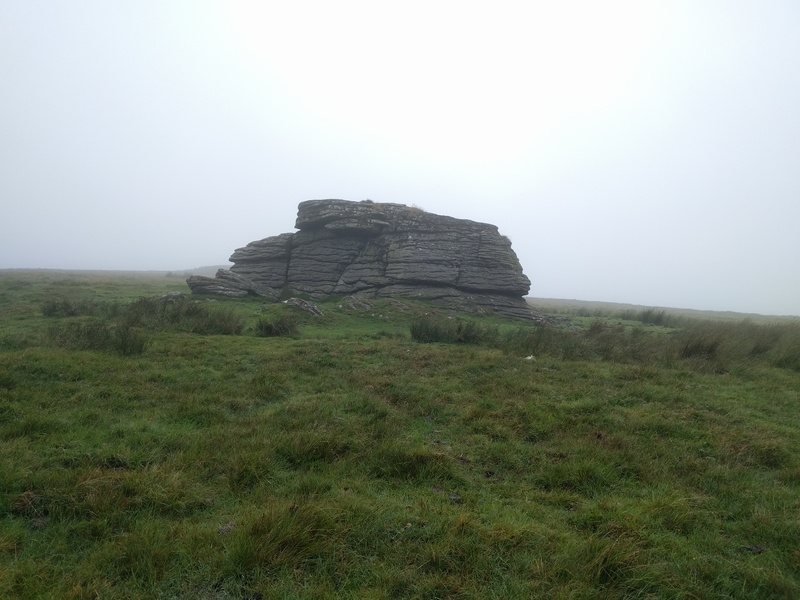 Across the road and Yar Tor, accompanied by Jim’s litany of woe about the time they climbed it from the East Dart. 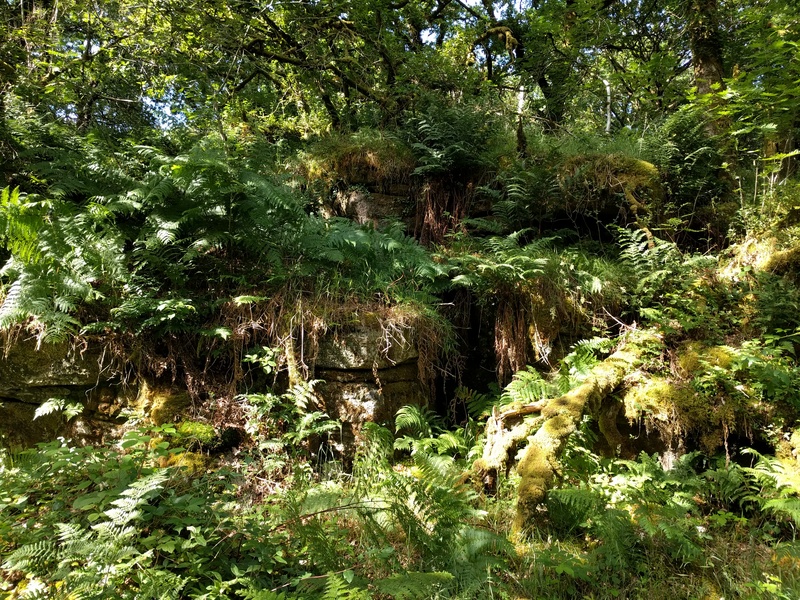 He seems to have a thing about steep hills covered in ferns, it seems. 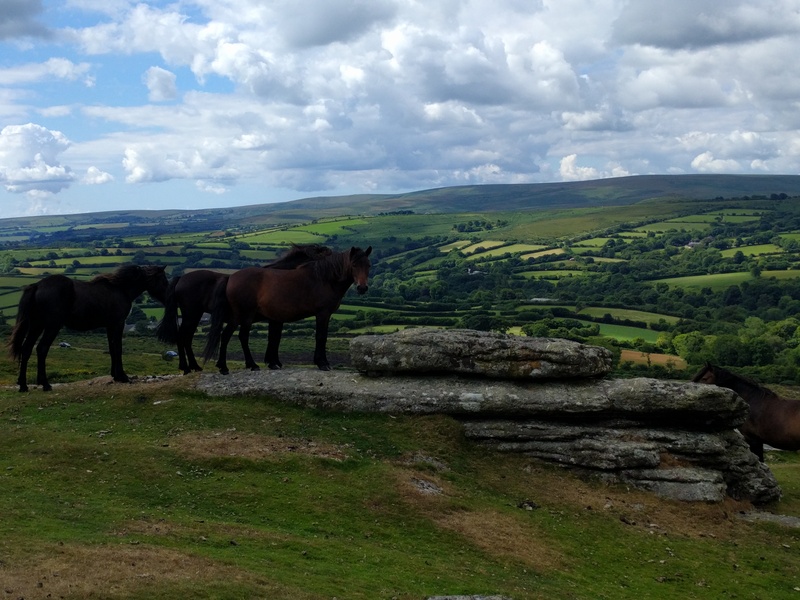 He got over this by going over and talking to some Dartmoor ponies. 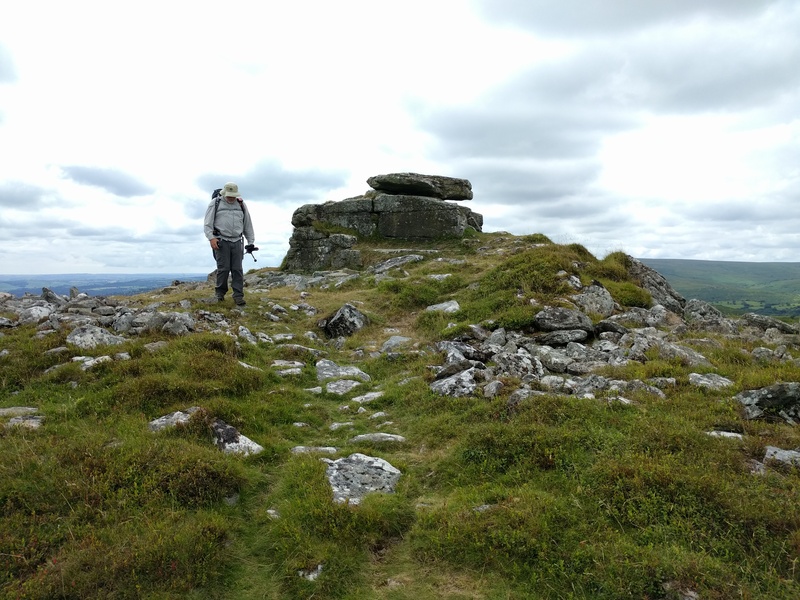 Corndon Tor and Corndon North were next, but neither were considered worthy of a tor-sit – that honour was saved for the next one: Cathanger Rock, our lunch stop. 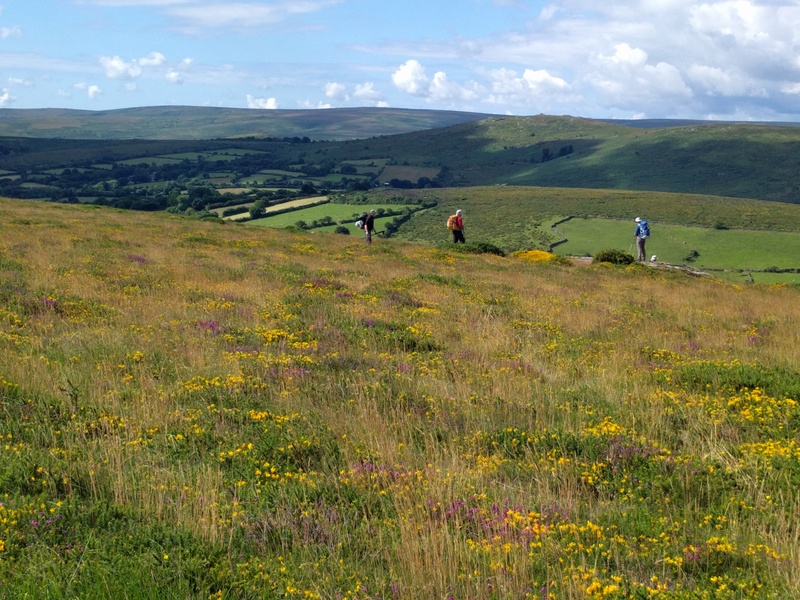 Decision time now, mainly about how far north we would go and whether we would extend to the tors the other side of the East Dart: Bellever, Laughter and Huccaby. A couple of miles of walking later and we rocked up at Cator, or at least as close as we could get to it. 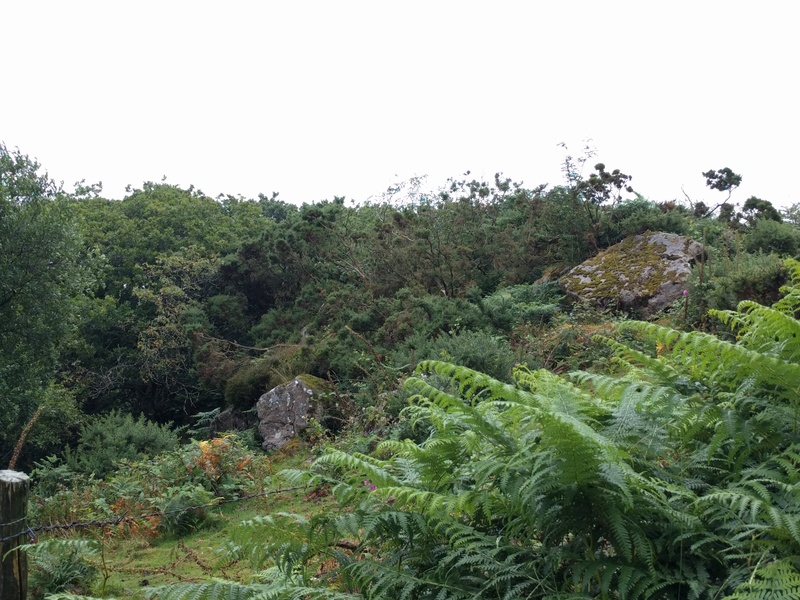 A dreary walk over Riddon Ridge followed, marking this hill down as one not worthy a return visit. 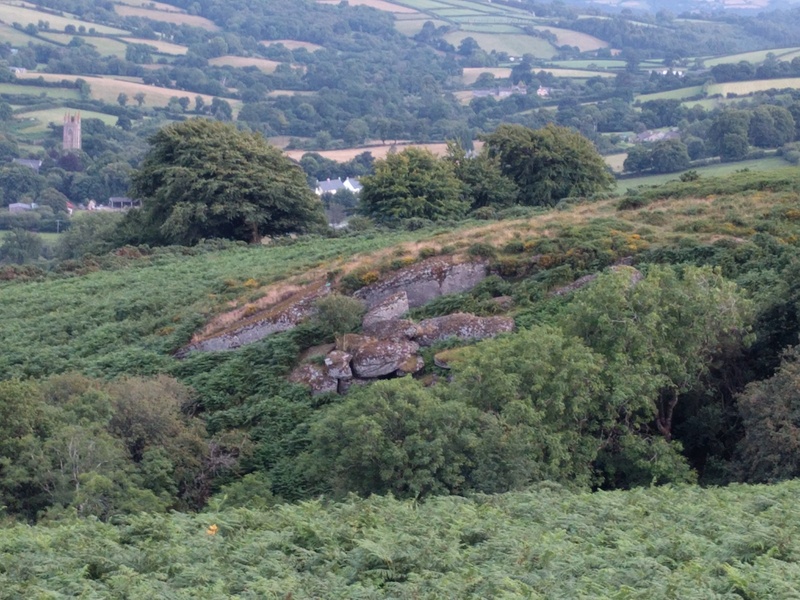 With the plan to visit Bellever, Laughter and Huccaby ditched, Blacka Tor (East Dart) was our next target. However, the East Dart was between us and it. So a wade was needed. Standard procedure on these occasions is to send the shortest member of the party first – if they survive, then those less vertically-challenged will be fine. And so Paul made the first attempt, cameras ready in case he cocked it up. 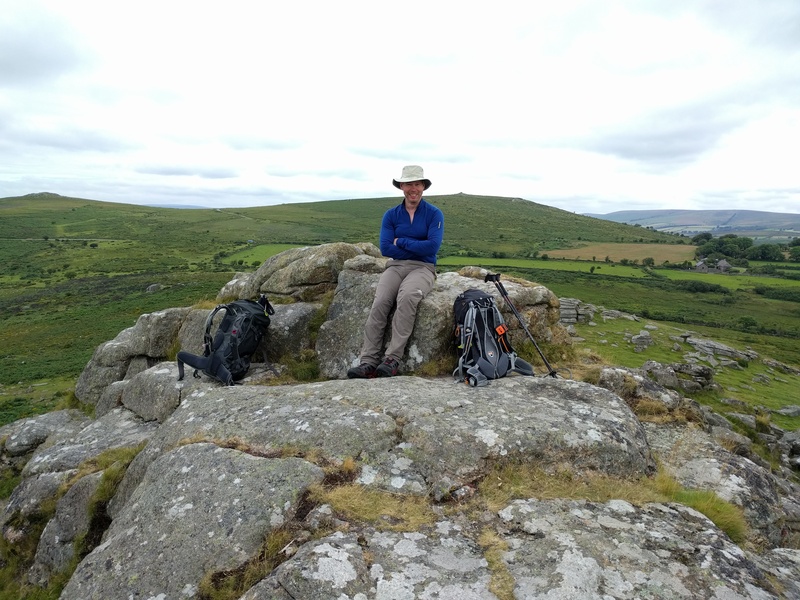 By the time Jim and I had crossed, Paul was pretty much halfway up the hillside sitting on the tor. We chased after him. A visit to the lower outcrop just above the river was needed too. 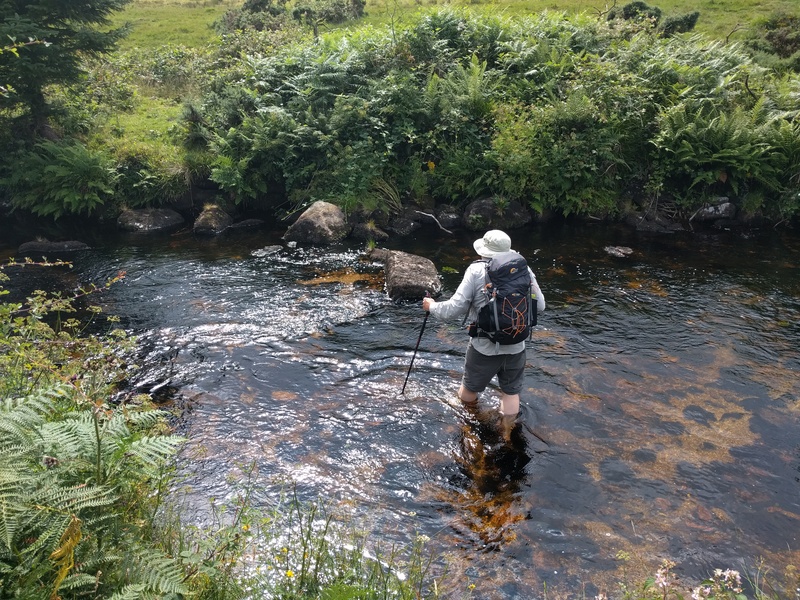 We then headed downstream to find the next crossing point. Much shallower but harder underfoot and with less likelihood of making money by sending the video into You’ve Been Framed. 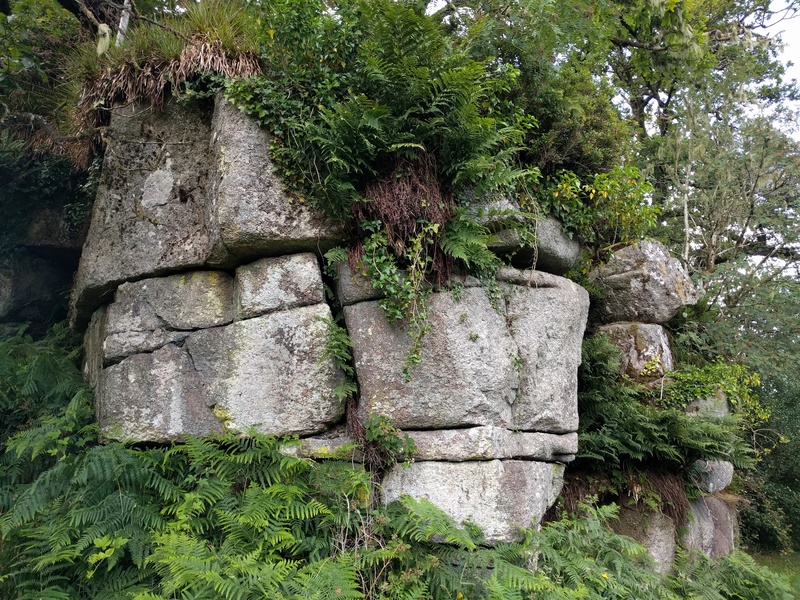 We followed a narrow path through the gorse and ferns which then became wood proper, finding a huge expanse of rocks on the hillside above the river that was clearly a tor. But one without a name, so not on any of our lists. We couldn’t come up with a suitable name, at least not one that was printable. A crossing of the clapper bridge and a short walk and we were at Badger’s Holt for afternoon tea. And soon back at the car. After a bit of faffing about, we all managed to meet up in the Old Inn in Widecombe for a pint before heading out for our camp. 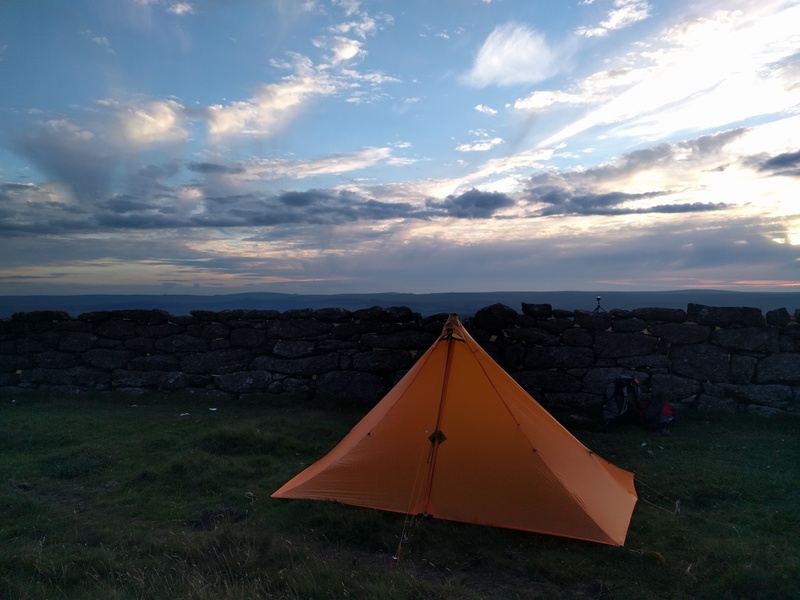 Swapping out daypacks for overnight packs was a bit of a shock to the system, especially as there’s no useful water on Hameldown, so we had to carry everything up with us. Water for camp, for the next day’s walk, the mandatory beer and whisky added a good 3.5kg to my load. It was a slow trudge up onto the down. First stop was a detour to Wooder Goyle Rocks. Then with the day fading fast we headed for the top of the Common to find a spot to camp. I left the action cam timelapsing the demise of the sun, and sorted myself out for the night. Taunts from the others as to what I was missing lured me from the tent to find a vivid orange sky and a decent sunset. Still, it’s all on video anyway. The temperature plummeted and we retired for the night. 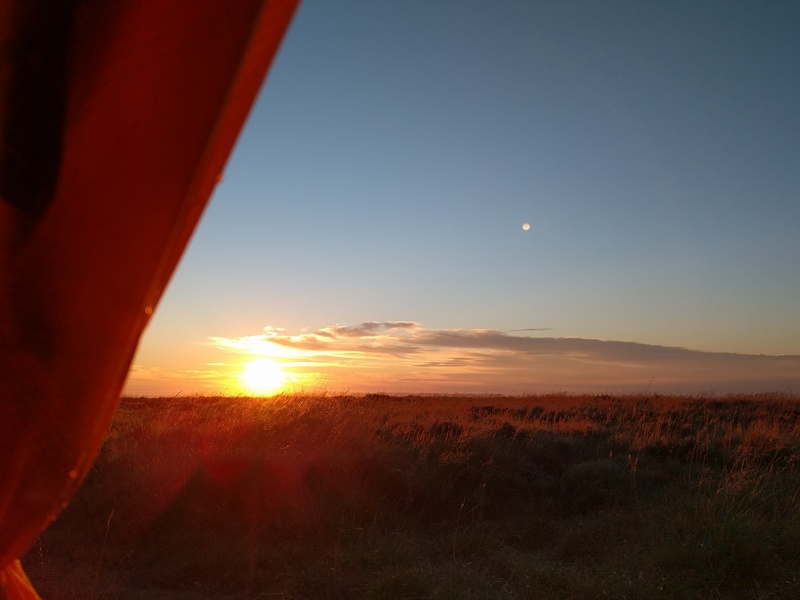 When I first started wild camping I always missed sunrise, sleeping through it just like I was in my bed at home. Now, though, I seem to naturally wake at the right moment. And so it was. 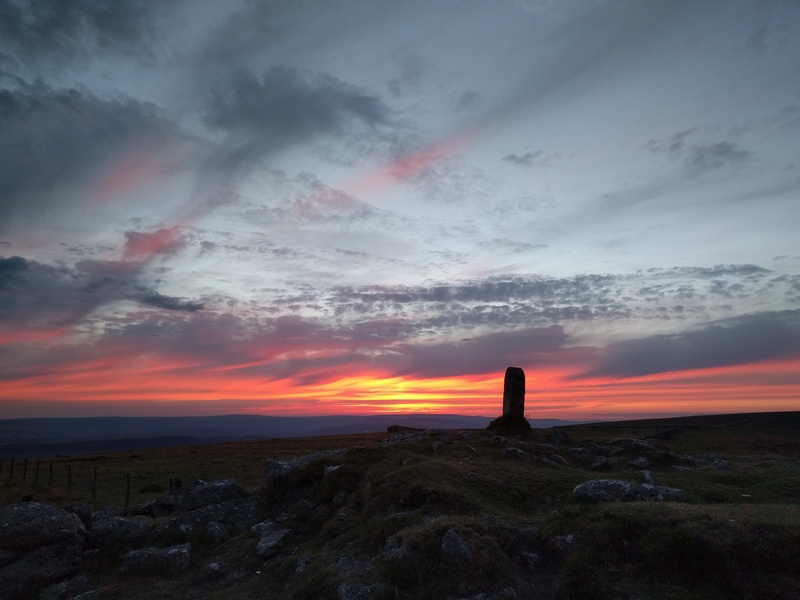 I emerged to the first bands of colour appearing in the sky, set the camera up for timelapsing, and retired to my shelter to watch it all from a horizontal position. 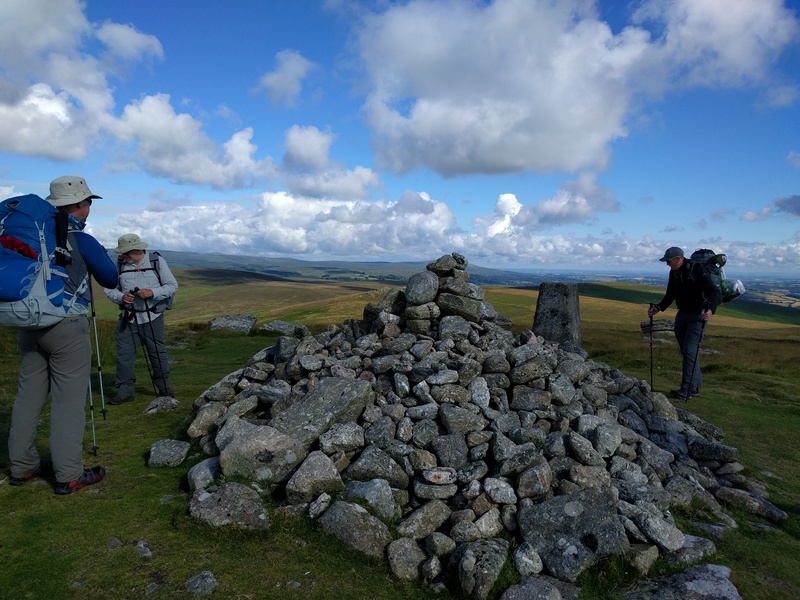 We headed north to bag the tors on the top of the Common, picking off Hameldown itself and Grims Tor, before retracing our steps and visiting Stoneslade and Kingshead Tors. 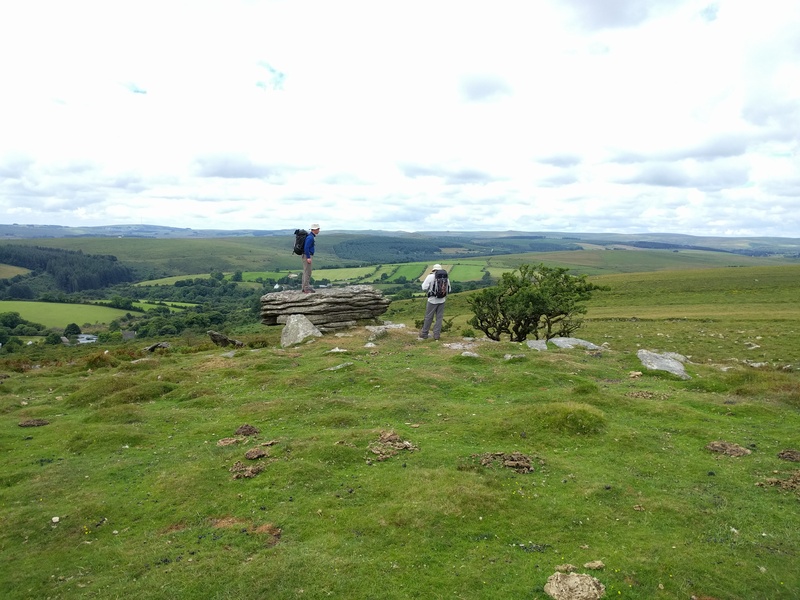 After Langworthy Tor, Col and Neil headed home, and Paul headed for Wind Tor via Rowden Tor. Jim and I couldn’t be bothered with the detour to Rowden, so just headed for Wind. This gave an excellent opportunity for a bit more tor-sitting while waiting for Paul, and for Jim a bit more horse-whispering. Paul caught us up and we headed for the car, a Fox Tor Cafe lunch, a pint and chilling out for the rest of the day while the tents dried in paul’s garden. I’d been nervously watching the forecast for Monday and Tuesday as the rest of the trip was totally tied-in to it. With Paul back at work (ha ha!! ), Jim and I were only going to stay as long as it was worthwhile. After breakfast in the Fox Tor, Jim decided to head home while I decided to hang out one day more. 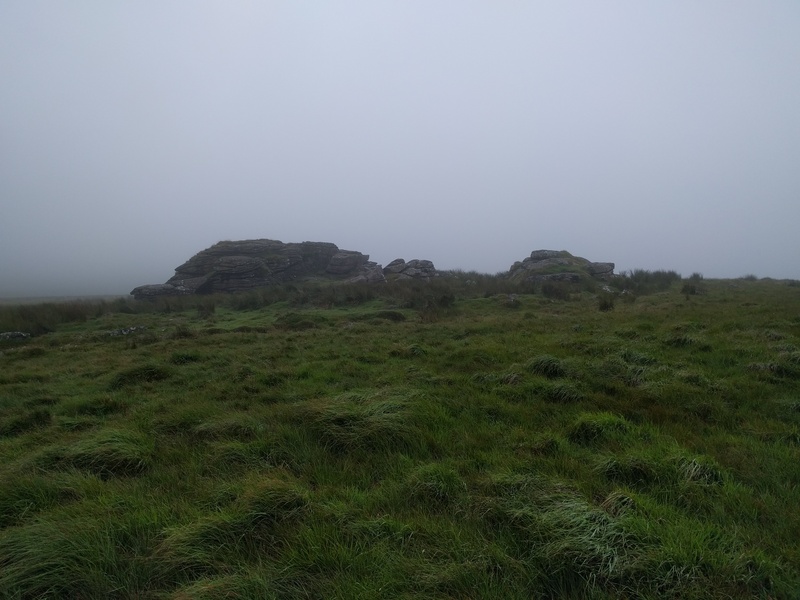 Monday’s forecast was nasty with heavy rain and low cloud the whole day, making it not a day for a long walk on the moor. No this was the day for a tour of the moor in the car. I hatched a plan which would give me the opportunity to pick off a few things really close to the road, but which also would yield somewhere to paint the view, if the cloud lifted at all (which it didn’t). 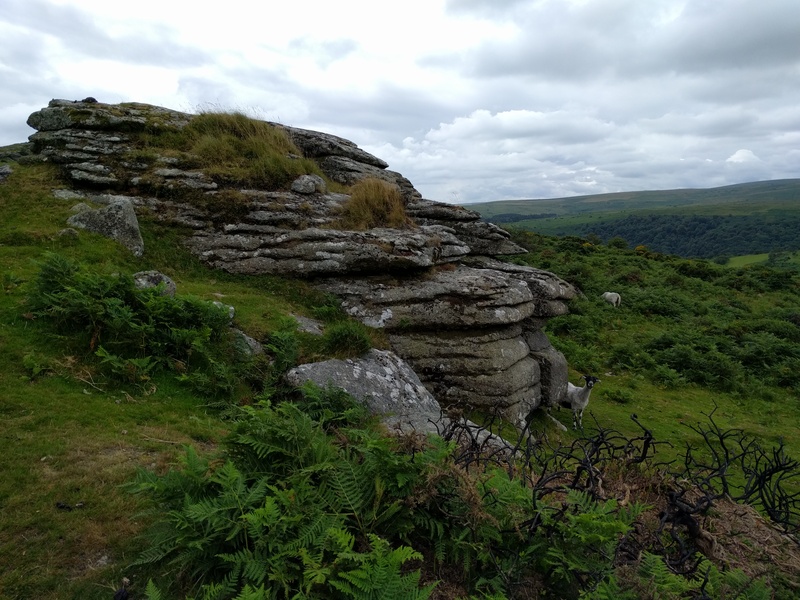 First stop was Combestone Tor, so close to the road I could have spat on it from the car. I ran over to the rocks, had as long an “explore” as I could bear and retreated to the sanctuary of the car. 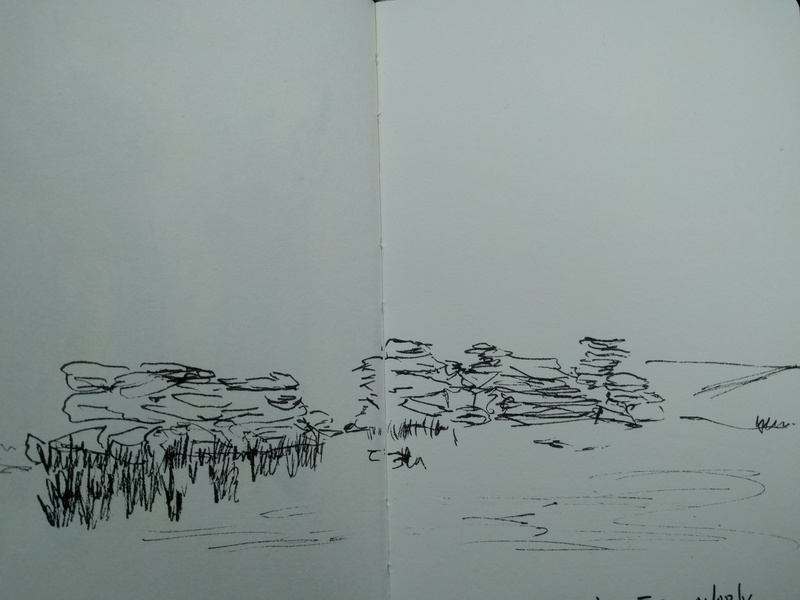 Instead, I got the sketch book out and attempted to explore it through the medium of ink. Continuing, I headed for Buckfastleigh to pick off a couple of hills right on the edge of the National Park. Rain streaming down the car windows. 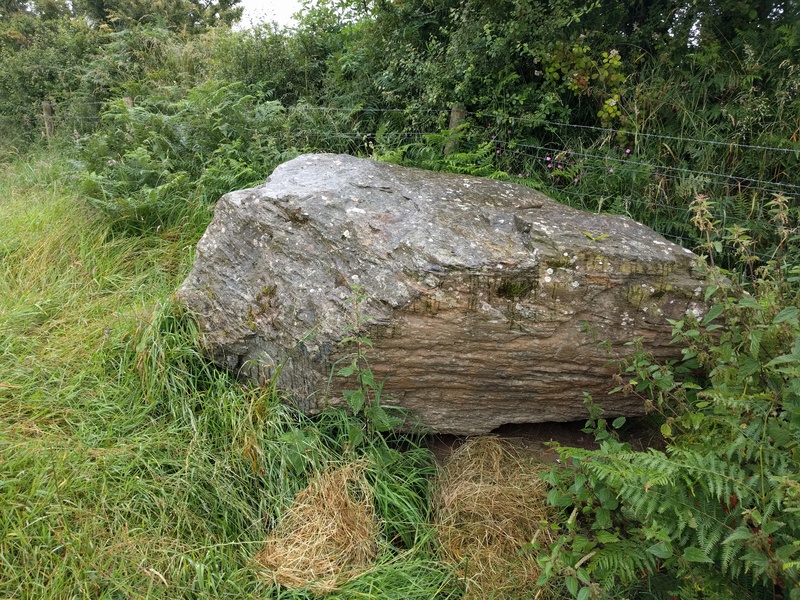 Along the A38 to Plymouth and then up to Yelverton to pick off Roborough Rock, conveniently right by the road. Actually I quite liked this one, lying like a sleeping animal on grass by a golf course. 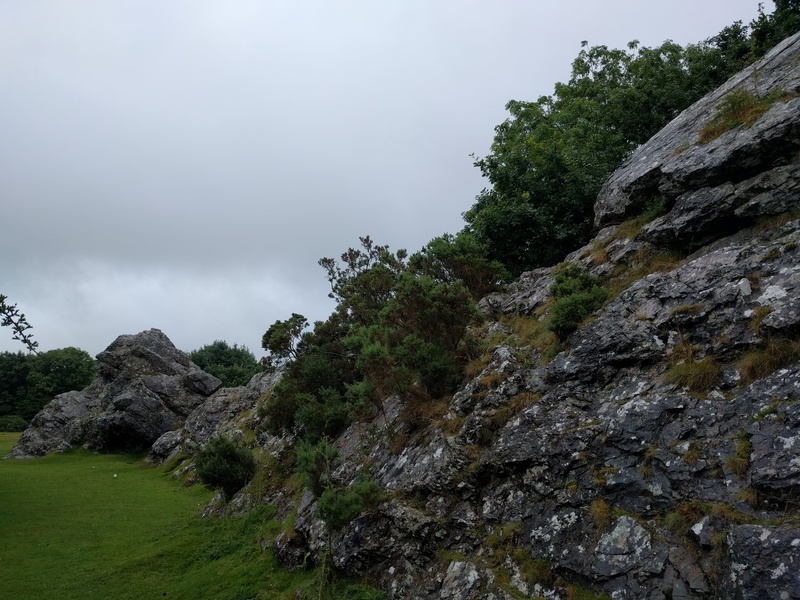 With the rain having eased off a bit, I headed out of Yelverton in the quest for Callisham Tor, lying on private land but close to a right of way. Parking in a lane, I made my way through a field of wet grass to find the tor, getting as close as I could without tangling with the formiddable barbed wire fortifications. Feet were soaked just from walking through wet grass. Great. Back in the car, and a scarily narrow lane out of Walkhampton took me to Gipsy Rock, foliage thwacking both sides of the car all the way. Not somewhere you want to meet someone coming the other way. It was a relief to get back to the “proper” road. I drove up past Sharpitor, hoping against hope I’d find a spot to park up and look at some sort of view. Nope, just a lovely view of fog. I gave up. Soon I was checked-in to the Fox Tor’s bunkhouse, which I was delighted to discover I had to myself. The plan on Monday had been to wait it out for the forecast better conditions on Tuesday, with only light rain forecast and conditions that looked quite likely to improve faster. It wasn’t to be though. Tuesday was just as murky, albeit with lighter rain, so I packed up the car and headed home. The weather window was well and truly shut.